KIEV, Ukraine -- Meanwhile, Russian forces busily resupply for Ukraine ahead of a Spring offensive, according to numerous sources including a former head of NATO. According to my own sources in Ukraine, where I was two weeks ago, Russian military assets have spread broadly all along Ukraine’s eastern border formed up in three waves in order to stretch and overwhelm Ukrainian defences across an entire front. While the world wrangles about Iran’s nuclear ambitions in the future, the one country that can physically obliterate the West in the present, the same sole country that openly threatens to use nukes, gets a free pass as it invades and occupies parts of Europe – repeatedly. This column has oft noted how Putin can’t resist the cover of a distracting global headline for launching or relaunching his incursions: Beijing Olympics and Georgia, Sochi Olympics and Crimea, FIFA World Cup and Donbass etc. What we deduce above all, what we should know by now, is that the operations were planned long in advance to coincide with those distracting occasions. You don’t unleash hundreds of armored vehicles across borders without months of preparation. So it’s not anyone else’s fault, not Mikheil Saakashvili’s provocation in Georgia, not Ukrainian ‘fascists’ in Crimea or Donetsk. Mostly, the apparent justifications for aggression (“provocations”) were equally pre-concieved along with the blizzard of disinformation that muddied the world’s reaction post facto. By now, none of this should need saying, but it does alas. Saakashvili’s ‘wild and crazy’ actions didn’t cause the 2008 Russian invasion of Georgia. The Kremlin’s tanks were already rolling in through the Rokhi Tunnel into South Ossetia. Intercepts from that time, subsequently made public, then published everywhere and conveniently ignored by a feckless West, reveal the timeline indisputably. In fact, President Saakashvili had ordered his troops to refrain from engaging as they came under intense fire. They objected, as did the overrun Georgian villagers. For an elected President not to respond at all to aggression would result in just what Moscow wanted: regime change. Putin unveiled the game plan for all to see. You fight back, you lose – you don’t fight back, you lose. The Ukrainians understood the warning. They had a choice: either to live under a suffocating web of post-Soviet corruption, endlessly postponing a full and free sense of citizenship in a genuinely democratic society, or rise up and perhaps be invaded by Russia. They decided to risk the latter. That is, they decided to trust their future to their own choices come what may, rather than allow choices to be made for them collectively by shadowy power-deals among elites that dictated to the state. With elections serving as a rubber-stamp process. In short, for Ukrainians the fight against corruption, infantilization, fatalistic resignation at home became a universally meaningful struggle against a dark empire abroad. We are witnessing the classic face-off between a young western democracy and a despotic old eastern empire, a narrative that goes back to ancient times. It used to be a prominent genesis-myth of Western civilization, the ancient Greeks voting for their destiny and going on to confront the might of invading Persia, the young Republic of Rome overcoming Hannibal after being defeated by him several times. In each of these narratives, the salient part of the drama involves a free people’s resilience, self-reliance and self-determination, the invincibility of openly debated and fully transparent people-power. That organic vigor, bred in the process itself, rises to challenge the strategic force and trickery of a corrupt great power. In Ukraine, the process of achieving full rejuvenation continues apace. The internal grass-roots popular revolution hasn’t surrendered goals or momentum, even as the larger forces outside want it to quiet down and subside. Here we have the exhilarating spectacle of the West’s deepest principles being espoused despite threats of destruction. Ukraine has invited unimpeachably honest and super-competent Georgian technocrats to take over key parts of the anti-corruption campaign. Dwell on that a moment: a country voluntarily invites foreign political figures to guide its national destiny, so determined is it to live impartially by its avowed ideals. 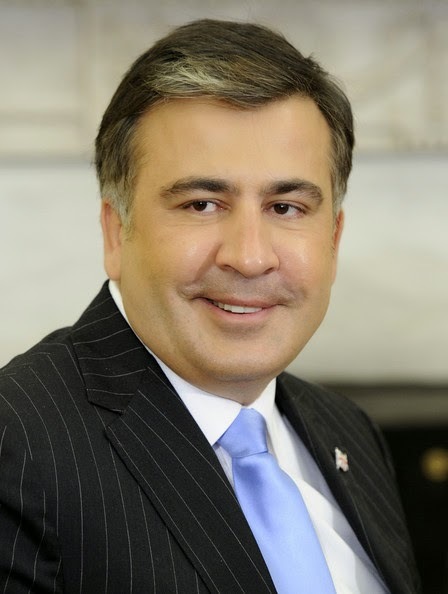 Mikheil Saakashvili serves on Poroshenko’s Presidential Advisory Council. Former top public servants of his historic Georgian administration now work in equivalent Ukrainian positions. That’s because Saakashvili’s Georgian reforms became an international brand. Over the years, countries as far afield as Surinam met with members of his team to see how to transform governance in the same way. In Ukraine two examples will suffice. Georgia’s wildly popular top cop, the quietly charismatic and formidably incorruptible Ekaterina Zguladze-Glucksmann, now works as Ukraine’s Deputy Minister of Interior. So acclaimed was she in Georgia that Ivanishvili even asked her to stay on. Imagine the conflicts if she’d been there as Ivanishvili reintroduced mafiotic practices into the societal fabric. Now she has launched an overhaul of law enforcement in Ukraine at all levels, from slimming the swollen bureaucracy to retraining personnel to civilian oversight groups. Similarly, the staunchly honest and quietly workaholic David Sakvarelidze, formerly the Chief Prosecutor in Tbilisi then parliamentary MP in Saakashvili’s party, is now Ukraine’s Deputy Prosecutor General. Among other tasks, he aims to take political influence and bribery out of the rule of law and bring public trust back to his pivotal office. Both are young, seasoned, selfless idealists in their thirties. They could be pulling down huge salaries and living the good life anywhere in the world. Instead they’ve chosen to work round the clock as civil servants for the people of Ukraine. Both spoke to me of living up to the ideals of Maidan, delivering on the hopes of national rebirth still alive and palpable in the air. As Western values are confounded and compromised everywhere, not least in the West, the one place where they pulse with conviction they’re threatened with outside obliteration. Putin understands: The last thing the West wants, it seems, is to be reminded of them.